Do you have other Microsoft products besides Windows? Turning on Microsoft Update helps you keep Windows and many other Microsoft programs, such as Microsoft Office, updated all in one place. 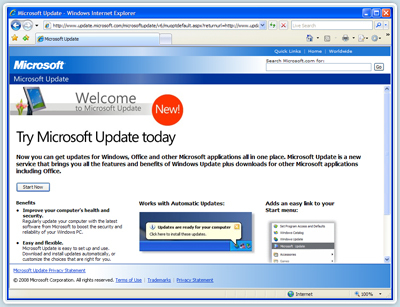 If you've been using Windows Update with Automatic Updates turned on, Windows Update will continue to check for and install High-priority updates for your Windows XP –based PC. 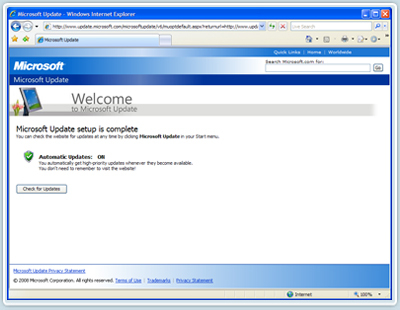 Note: The first time you visit Microsoft Update, you will need to install the updating software on your PC. 2 - Click Start Now, and then click Continue. 3 - Automatic Updates is turned off by default. 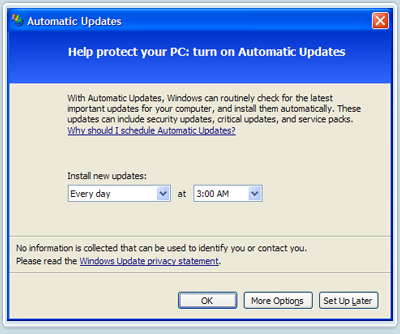 To turn on Automatic Updates, click Turn it on now. 4 - Select when you want the new updates installed. Click OK. Automatic Updates are now turned on. 5 - Click Check for Updates. 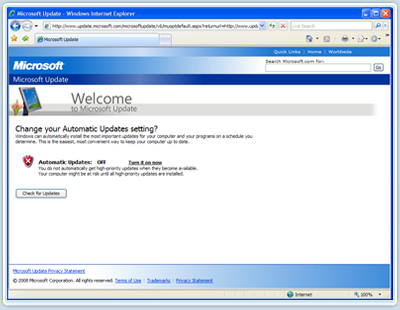 6 - Now that you have set up the Microsoft Update service and turned on Automatic Updates, click Check for Updates. Click either Express or Custom installation. 7 - Express finds High-priority updates for your PC, which you install with one click. Custom finds both High-priority and Optional. You individually review and select the updates you want to install. A. Get answers to questions you have about Microsoft Update. B. Another opportunity to sign up for Automatic Updates. 8 - Microsoft Update scans your PC to identify which updates your PC needs. Follow the directions on the screen to download and install them. 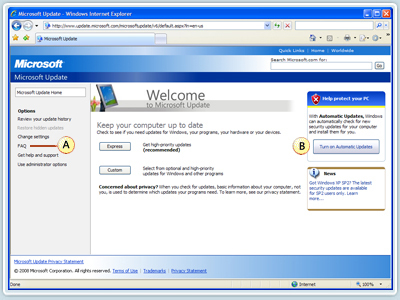 Tip: Find out how to keep earlier versions of Windows (Windows 2000, Windows ME, Windows 98, Windows 95, and Windows NT) and Microsoft Office versions up to date.